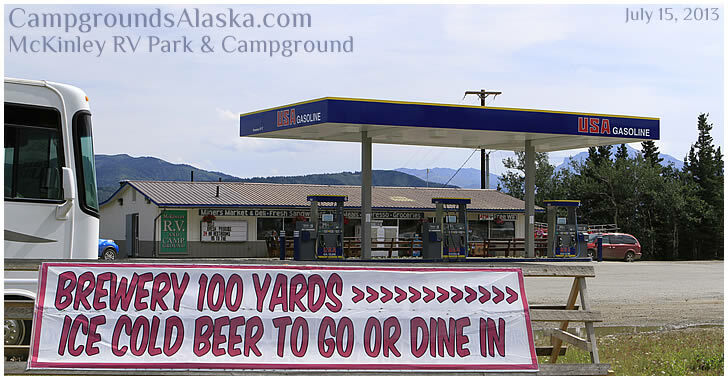 McKinley RV Park, Healy AK. Directions - McKinley RV & Campground is located directly behind the Healy Gas Station, (Miners Market), at mile 248.5 of the Parks Highway. Description - Very nice park located over the hill from the Miners Market in Healy. Everything you could want is within walking distance of the campground including restaurants and nightlife too. Water - 27 plus a faucet for dry campers use. Payment Methods Accepted - Visa, Mastercard, Cash, Debit, ATM. Full service campground conveniently located just north of Denali Park on the Parks Highway. By staying at the McKinley RV Park in Healy you save both time and money over the more congested RV parks to the south.